Sometimes we need to take screen shots of our active window. Taking screenshots of a visible area is easy, there are plenty of tools supports capturing such area. But when it comes to capturing scrolling windows screenshots, there are only few tools which works perfectly. In this post I’m going to introduce software or tools which supports capturing scrolling windows screenshots. In most cases we need scrolling screen capture feature in Browsers. So let’s start with browsers apps which supports scrolling window. Google chrome is one of the most popular web browser, if you are still not using this go and download now. If you visit Chrome web store you will see a lot of extensions that supports screen capture, here I only add few extension which works. This is an official extension which supports scrolling window screenshots on your chrome browser. This app also supports capturing region of a window, capture visible content and whole page (scrolling page). Once you capture an image with this extension, you will get an extra options to edit that image. You can Highlight selected area, you can use arrows on the image, you can type text on the image or you can blur selected region with this extension. 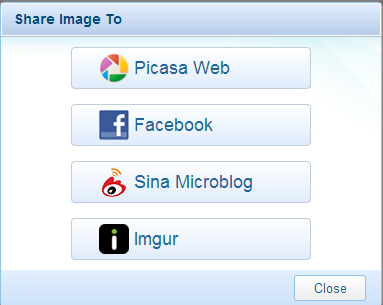 After editing image you can save that image to your desktop or share that image with image sharing websites like Picasa web, Facebook, Sina Microblog and Imgur. I recommend you to use Imgur service. This extensions save the account information with the extensions itself, so we don’t need to enter our login information again and again. If you extensions doesn’t works properly or if you feel this is not for you, then try below similar extensions. Awesome screenshot capture: The best thing about this extension is, you can save or upload image without sign up to their website. All your upload will be removed after 1 month. All these extension supports capturing scrolling window screenshot. If you search for screen capture add-on for firefox, you will get lot of add-ons in search result. In those results most of them won’t supports for latest version of firefox browser. Here I have picked best screen capture tool for your Firefox browser which supports full page or scrolling window screenshots. This is best and fastest way to take, edit and share your screenshot with your firefox browser. 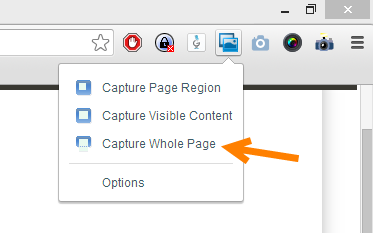 To take scrolling page screenshot, just choose Capture Full page option. Once you capture the image you will get an option to edit that image. With this add-on you can annotate it with rectangles, circles, arrows, lines and text, blur sensitive info, one-click upload to share options. After finishing editing click Done option to save that image to your PC or upload that image to free image hosting site. This is the only add-on that I found easy to capture screenshot on firefox browser. 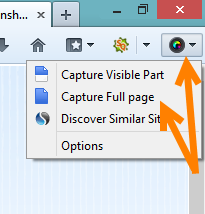 If you are using Internet explore browser, then I recommend FastStone Capture tool to capture entire page screenshot. To capture scrolling window from faststone capture tool, visit the site that you want to take scrolling page screenshot and open this tool and choose Capture Scrolling Window <Ctrl+Alt+PrntScr>. If you need to capture scrolling window screenshots in File explorer window or on any other application, then also I recommend faststone capture tool. I tested it, and took screenshot properly. You can also try PicPick software to take scrolling window screenshot. I tried this, but it fails sometime. These are all the free tools that you can use to take scrolling window screenshot. If you are ok with premium option, then I recommend Snagit software. But snagit doesn’t works well with chrome browser. I was happy with the Awesome screenshot capture extension in Chrome. Thank for this post. Sweet, thanks for the tips! Know of any scrolling window capture programs for Linux/BSD? I’m trying to find some via alternativeto.net but so far haven’t found any. >> If you are ok with premium option, then I recommend Snagit software. But snagit doesn’t works well with chrome browser. The reason I’m looking for a scrolling screen capture utility, is because my SnagIt, fails most times when trying to scroll capture a Firefox web page. I’m very disappointed having purchased SnagIt, only to have it always fail.